At the risk of being unpopular, let me suggest the following: the two proposed play areas for downtown Victoria – at the former Tent City site, and Reeson Park, a.k.a. the Whale Wall – are first and foremost about displacing poor and homeless Victorians. Creating space for children and families is a distant and secondary goal. It’s true that City Council has been looking at creating a “purpose-built play option” downtown for years, and I have no problem with that. Playgrounds are great! However, it is impossible to ignore the fact that both of the active proposals “to address the shortage of play opportunities in the downtown area” are (or were) areas used by homeless Victorians. And when you have playgrounds in Victoria's parks, Council has a bylaw on the books that says that homeless Victorians can no longer use that space in the same way. Reeson Park, a.ka. the Whale Wall. Reeson Park, at Yates and Wharf, is the site of Victoria’s annual commemoration of Canada’s National Homeless Persons’ Memorial Day. The park is currently used as a gathering place during the day by poor and homeless Victorians, some of whom also use the area to camp. It is an important site for Victoria’s street community. City staff suggested the park as a potential site for a play area in 2014, shortly after the City acquired the land from the province. On the surface that may seem fine and good – playgrounds for all! – but you don’t have to look very far to find a potential ulterior motive. Re-developing the park was already on the table because of the ongoing Harbour Pathway project, and changes to Reeson were among the “highest priority” for improvements. Why? Because altering the park could also “Resolv[e] Other Issues,” namely “creating a safer public environment” (p. 658). The language of “safety” is often employed when talking about projects (e.g., lighting) designed to displace or police people already using a space. Park proposal at Reeson. Read the full plan online here. The idea that homeless Victorians somehow aren’t members of the public is appalling, particularly as they may not have access to any private space of their own. And the fact that someone suggests building a condo to displace the current users is gross. The city summarized the consultation by saying there was a “Positive reaction to changing the park to accommodate the changing neighbourhood” (p. 41). If I can summarize that summary: those who support the gentrification of the neighbourhood are totally on board with more gentrification. Staff have written online that camping is not just banned “in” Victoria’s playgrounds, as the bylaw says, but “near” them as well. That's a telling indication of how the bylaw could be used at Reeson Park. At a minimum, many of the people who currently use the park will likely be displaced during construction, and they may be permanently displaced if the city’s interpretation of the bylaw is applied (no sheltering near playgrounds). Playgrounds are great, but they should not be used to displace people with nowhere to go. The City might publicly state that the Reeson Park play area won’t end camping at that spot. That would be a good start. But the city’s stated goal of redesigning the park to improve “safety” has deep roots in previous VicPD and provincial government attempts to police individuals who are using that space. 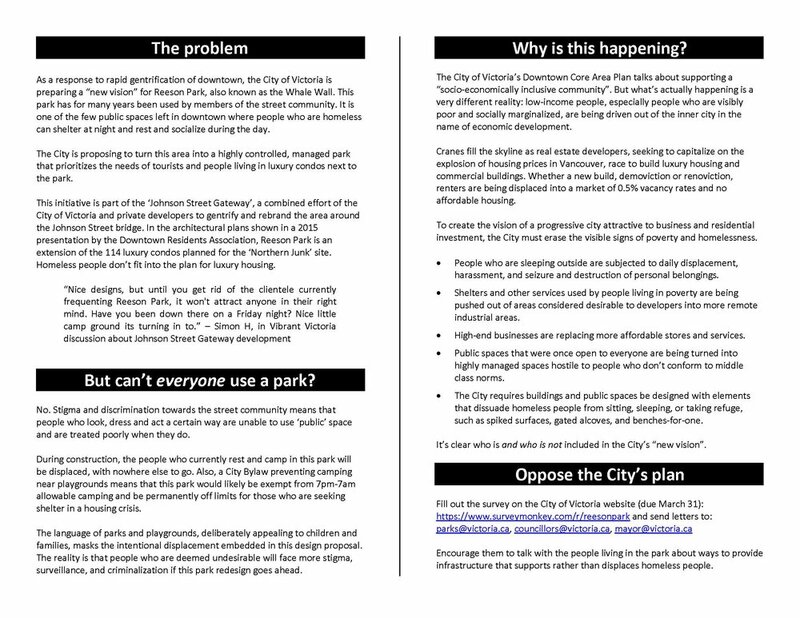 Local activists have produced a flyer (see below) outlining a number of outstanding concerns about the redevelopment of the park. When people who don’t have their own private space occupy an otherwise unused or underused area, more privileged individuals often start to publicly fret that they have been excluded from that same spot. People who used those arguments during last year’s Reeson Park consultation said or implied that homeless individuals and people using drugs in the park were putting others at risk. However, only one commenter identified a specific incident, and I suspect the vast majority of responses were based more broadly on anti-poor and anti-drug stigma and discrimination. 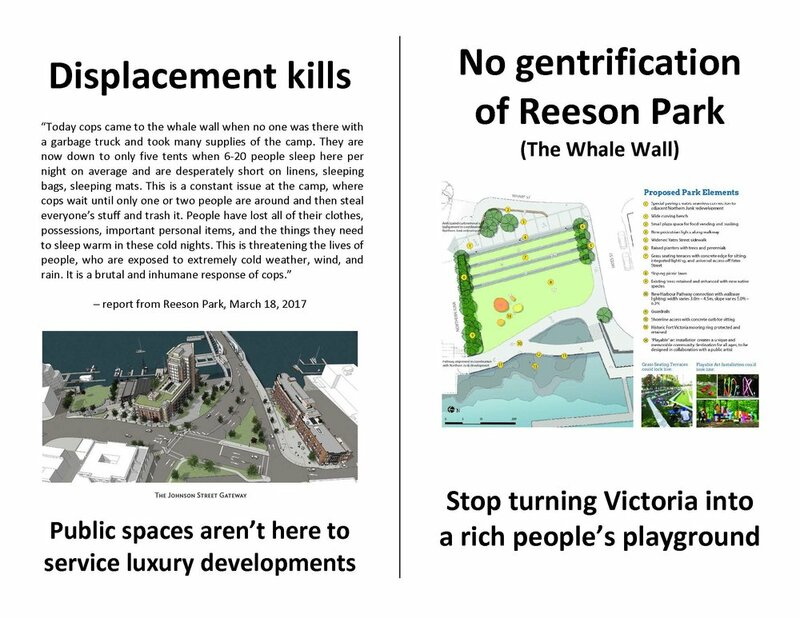 Having the City build a new park, condo, or playground at Reeson Park could erase visible homelessness at that location, but it will do nothing to erase homelessness in Victoria. Nor will it do anything to change the minds of the dozens of Victorians who were eager to let Council know they are not just uncomfortable with, but afraid of, visible poverty and drug use. I won’t pretend to know how to undo years of ingrained prejudices, but they are worth challenging, and playground-ing homelessness out of the downtown core won’t get us there. If you are interested in commenting on the Reeson Park proposal, you can take the city’s survey until March 31st, 2017. There is also an open house event on March 21st, 2017, at 4:00 pm. The following flyer, produced by local activists, outlines a number of concerns with the Reeson Park proposal. Not convinced that Victoria's downtown playgrounds are about displacement? This post was initially part of a longer piece that linked the Reeson Park project to the Tent City playground development, and the public conversation about using playgrounds to displace homeless people. I hope to post that follow-up piece very soon. Stay tuned! When is a planter not a planter?